Spelt is a wheat based whole grain which has a sweet, nutty taste. It stays fluffy and distinct when cooked, creating a nicely al dente texture for a ‘risotto’ style dish. This creation using trompette mushrooms, truffles and langoustine is lavish and delicious. Blanch the langoustines whole in the chicken stock for 1 minute 30 seconds. Remove from stock and refresh. Shell the langoustines, reserving the shells and heads. Remove the vein from each of the langoustines and discard. Refrigerate prepared langoustine tails. Return the reserved langoustine shells and heads to the chicken stock used to blanch them whole. Reduce chicken stock until a coating consistency is achieved, about 10 minutes. Strain through a fine cap sieve and return glaze to the pan. Finely chop the truffle and add to the glaze. Season to taste and keep warm. Peel and finely chop shallots. Sweat over a low heat in rapeseed oil until soft, about 5 minutes. Rinse and drain the horn of plenty mushrooms ensuring all the grit has been carefully removed. Cut into long strips; add half of the mushrooms to the sweated shallots and reserve the second half. Peel and crush garlic, finely chop thyme and add to mushrooms and cook for a further 2 minutes. Add spelt and sweat for 1 minute before starting to add the hot chicken stock a little bit at a time, stirring continuously. Continue to cook until spelt softens but still has a little bite to it, about 20 minutes. Once cooked add butter, season and keep warm. Finely chop parsley, grate Parmesan and truffle and mix altogether. Pan fry the langoustine tails and the remaining horn of plenty mushrooms in rapeseed oil until cooked through, about 3 minutes. Coat with the chicken and truffle glaze. Plate the risotto into the middle of a warm plate and arrange the langoustines and mushrooms on top. Finish with a sprinkle of the parsley, Parmesan and truffle mixture and a drizzle of rapeseed oil. 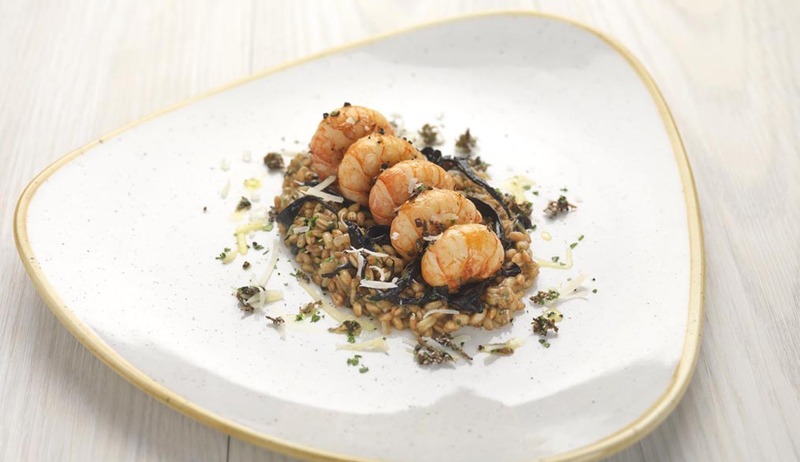 This very visual dish uses ingredients of very contrasting origin, the humble spelt paired with the more noble langoustines and truffle. As it is after all a New Year celebration, the glitz should prevail and we will elect a sparkling wine or more precisely, a Champagne. The contender needs to be a full, rich and concentrated style. This is to be able to cope with the strong scent of truffle, the crunchy texture of the spelt and the delicate flesh of the crustacean. Thanks to a high proportion of oak matured reserve wine, a predominance of Pinot Noir and an extended ageing in bottle, the Champagne Philipponnat Royale Réserve Brut NV has it all. If you can’t find this wine, you can either pick an older vintage Champagne or Brut Non Vintage that you have kept for 2 or 3 years after purchase (if it is ever possible to wait that long!). !